BERLIN, Germany -- Ukrainian Prime Minister Arseniy Yatsenyuk says Russia is still sending military forces into Ukraine despite a September 5 deal on a cease-fire and steps toward peace. Ukrainian Prime Minister Arseniy Yatsenyuk and German Chancellor Angela Merkel address a news conference following talks at the Chancellery in Berlin on January 8. Yatsenyuk demanded Moscow remove what he called its "bandits" from Ukraine. Speaking alongside German Chancellor Angela Merkel after their talks in Berlin on January 8, he said Russia has "sent troops to Ukraine's regions and continues sending its troops there." "All this being done on the orders of Russian President Vladimir Putin," Yatsenyuk said. Russia denies involvement in the conflict in eastern Ukraine despite what Kiev and NATO say is overwhelming evidence it has sent troops and weapons across the border to support pro-Russian separatists. Merkel said the terms of the agreement signed on September 5 in Minsk must be met in full for sanctions imposed on Russia to be lifted. "The entire Minsk agreement must be implemented before we can say these sanctions can be lifted," Merkel said. 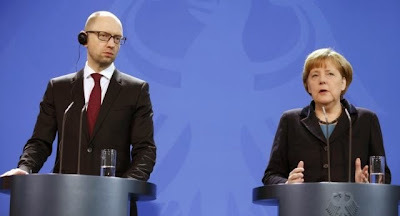 Yatsenyuk said that Russia "has not fulfilled a single point" of the Minsk agreement. The European Union and the United States began imposing sanctions on Russia after it annexed the Crimean peninsula from Ukraine in March, and have stiffened the measures in response to Moscow's support for the rebels, who have seized portions of Ukraine's Donetsk and Luhansk regions. The conflict between the rebels and Ukrainian government forces has killed almost 5,000 people since April. Merkel said she had "little hope" of a reversal of the sanctions imposed on Russia over its annexation of Crimea, which Kiev and the West say was illegal. Putin has vowed never to return the peninsula to Ukraine. Speaking earlier at the German Council on Foreign Relations, Yatsenyuk urged the West to present a united front in pressing Russia into compliance. "We can only succeed if we act together, when everybody in the EU, the United States, and Ukraine remains united," he said. Merkel said it would only become clear in the coming days whether a proposed meeting with the leaders Ukraine, Russia, France and Germany would take place as planned later this month in Kazakhstan's capital, Astana. Merkel also said Yatsenyuk had presented a convincing case for plans for badly needed reforms to Ukraine's economy, which has been battered by more than a year of political upheaval and war. Russia annexed Crimea after Ukrainian President Viktor Yanukovych abandoned power in late February and fled the country following months of protests over his abrupt decision, in November 2013, to scrap plans for a landmark deal with the EU in favor of closer ties with Moscow. More than 1,300 people have been killed in eastern Ukraine since the cease-fire, but fighting ebbed last month and Germany has been at the center of diplomatic efforts to end the conflict. Representatives of Germany, France, Russia, and Ukraine met in Berlin on January 5. Merkel said it would become clear in the coming days whether a proposed meeting this month that would bring her together with Putin, Ukrainian President Petro Poroshenko, and French President Francois Hollande in the Kazakh capital, Astana, will take place. Poroshenko said late last month that the four-way summit had planned for January 15, but both Merkel and Hollande have indicated they would only go if there was a real chance for progress. The foreign ministers of Germany and France spoke separately with Russian Foreign Minister Sergei Lavrov by telephone on January 8. Kazakh President Nursultan Nazarbaev is to meet Merkel in Berlin on January 9.